Floating along the waterways of the Okavango Delta in a mokoro (or dugout canoe) is a gentle and relaxing way to enjoy the wilderness, flora and fauna of this beautiful region of Botswana. You can take long trips by mokoro if you want, but most people prefer a couple of hours, or perhaps half a day. You sit in the mokoros on low seats, very close to the waterline, and your poler stands at the back and poles you along. You don’t have anything to do but sit there, relax, enjoy the invariably stunning scenery and perhaps take some award-winning photographs of waterlilies, reed frogs, and maybe the odd crocodile! We steer well clear of hippos when we’re in mokoros. 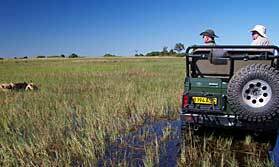 We definitely recommend this experience if you’re in the Okavango Delta as it is one of the iconic and unique activities offered in Botswana. It's great to combine a mokoro experience with game drives and also walks. Botswana's Okavango Delta. 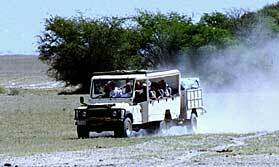 There are specific camps which offer mokoro rides. Some of these are known as 'wet' camps, where no game drives can be taken, but other have a combination of both water-based activities and game drives. Camps offering this activity include: Gunn's Camp, Kanana, Kwara, Pom Pom, Sango and Xakanaxa. 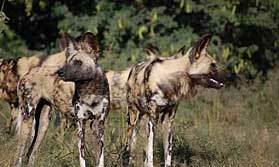 See our list of camps in the Okavango Delta. Mokoro trail are dependant on the water levels of the Delta waterways. Some camps offer mokoros all year, but mostly it's seasonal from around May to October. The camps and lodges offering this activity will simply give you the chance to do this as one of your game activities. The mokoros are poled for you, and all you have to do is relax and enjoy yourself - and maybe take a few photos of the painted frogs and birdlife that you pass. The trips tend to last in the region of an hour or two, but some can be much longer. 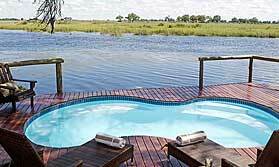 See Botswana without breaking the bank! A participation camping safari to all the main parks.